Fix for WordPress blank page with the word "error"
Today, out of the blue I lost access to my blog: only a WordPress blank page appeared with only the word -error- displayed. I encountered a similar error few months back and somehow after research I fixed it. But I forgot how I fixed it. So this time when it happened again, I decided to document it as a blog post and share it others who may be in a similar situation. If you run a WordPress blog with Better WP Security plugin, you may get locked out of your WordPress blog or admin page, resulting in a WordPress blank page with “error” as shown in the picture below. 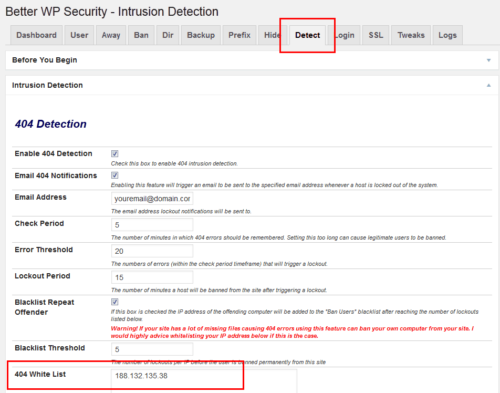 We know that the problem is due to Better WP Security plugin. If you have intrusion detection turned on and are banning spammers/hackers who are trying to login in to your account, Better WP Security bans the visitor and logs the banned IP address in the Lockout database. Sometimes, unintentionally your valid IP can get locked out. The solution is to identify your IP and delete it from the lockout database. To do this, you will need access to your MySQL database through phpMyAdmin or other means. If you do not know how to access your WordPress database, your hosting provider may be able to help you. If you are self-hosting and do not have phpMyAdmin yet, you may install it following this guide. First, visit WhatisMyIP and record your current IP address and Proxy IP (if applicable). In this case, we are going to assume that the IP address of the computer from which you are trying to access your WordPress blog is 188.132.135.38 and it is connected to the internet through a proxy server with IP address 188.132.135.217. Note that most people may not have a proxy server. 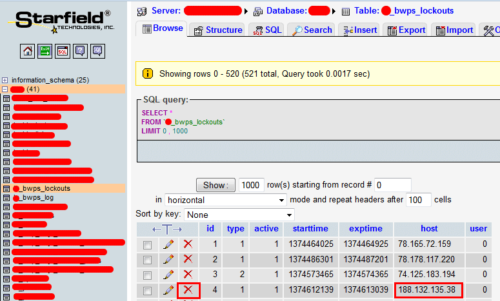 Then, login into your MySQL database through phpMyAdmin interface. Better WP Security stores lockout information in a table called “wp_bwps_lockouts”. Note that the preceding “wp” may be something else depending on how your WordPress was installed. Go into the “wp_bwps_lockouts” table and “Browse” the entries. phpMyAdmin typically shows only 30 rows from the table. Display more rows if needed and find the entry containing your IP address (and proxy IP address). Delete these entries using the red “X” mark each row. 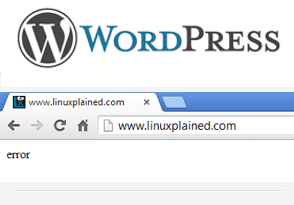 Now you should not see the WordPress blank page with “error” and be able to access your blog. 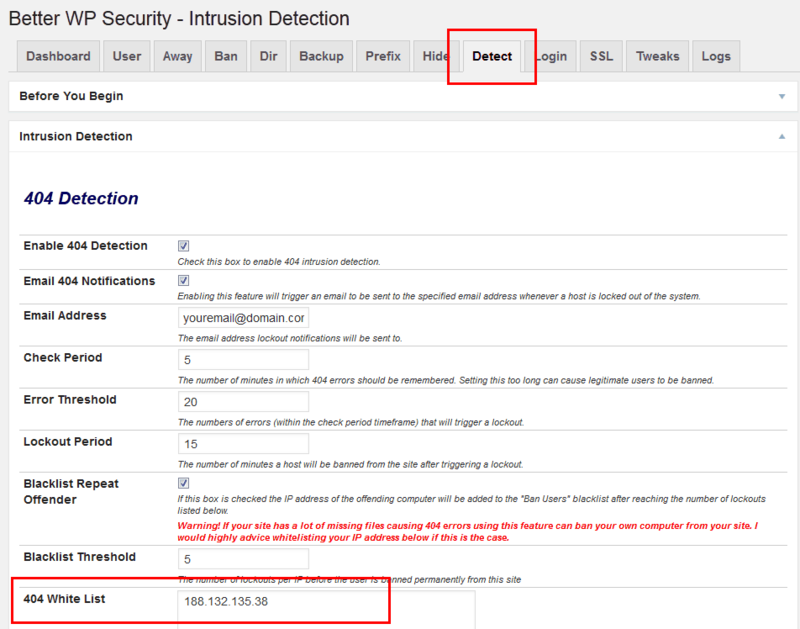 To ensure that you are not locked out of your site accidentally in future, you will have to whitelist your IP address (and proxy IP address) under “Detect” tab of Better WP Security settings page. The picture above shows that the IP address 188.132.135.38 is now whitelisted. If you have a proxy server, you may also want to list that as a new row. Alternatively, you could use wildcards. In this case, since the proxy server's IP address is 188.132.135.217, you would just list 188.132.135. * to whitelist all IP addresses that begin with 188.132.135. The last 3 digits could be anything (typically this covers all computers from the same network). This should ensure that you do not see the WordPress blank page with “error” message in future. If this helped you, please leave a comment and let others know. Happy Blogging!